Pepper is a warm-season crop requiring three to four months of frost-free growing days. Transplants are used to start the crop. Sweet, bell peppers are the most popular varieties in New England and are usually harvested green. 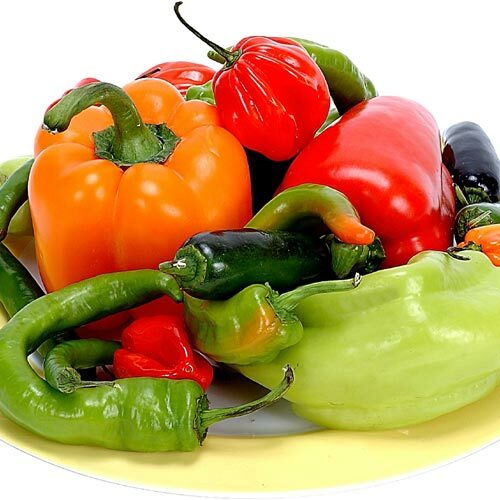 Sweet peppers become even sweeter as they mature, typically turning from green to red, although many different colored varieties are now available. Other types of sweet and chili (hot or pungent) peppers are also grown. Hot peppers generally become more pungent as they mature. Check variety descriptions carefully to obtain the proper pepper for your market. Growers should produce their own transplants or contract with a reputable local supplier to minimize the potential of importing severe disease and insect problems that are common in other regions. Sow seeds six to eight weeks before field setting in a sterilized or synthetic growing medium. Some highly organic, synthetic media hold water too well and do not permit sufficient aeration for the root system. Add sufficient sterilized course material, such as coarse sand or perlite, to increase drainage. Avoid compressing or overpacking media when filling containers. Peppers are a slow-growing crop and need protection from soil-borne diseases, especially damping-off organisms. Use seed treated with a suitable fungicide, disease-free media, and avoid over-watering. Avoid contamination from the greenhouse floor by lining it with plastic, growing plants on benches, and hanging watering devices when not in use. Do not permit moisture to remain on seedlings for more than two or three hours after watering. One ounce of seed will produce 4,000 to 5,000 plants. About 8,000 to 12,000 plants are required per acre. Seeds may be sown thickly in flats and later transferred to 1” x1” 128-cell trays until transplanting, although some growers seed directly into 2” x 2” containers or 72-cell trays for somewhat earlier production. Peppers thrive under warm conditions. Seeds germinate best at 85°F to 90°F. Seedlings develop well at 75°F during the day and 65°F at night. Peppers are susceptible to transplant shock. Reduce temperature and water and increase air movement around the plants to condition them for transplanting. A precaution: overly-hardened plants are slow to recover and yields may be reduced. Plants should be set in the field after the danger of frost is over, and the soil temperature is at least 60°F. Peppers develop a shallow root system and may need watering one to two times per week, depending on the soil type. The use of plastic mulch, especially if combined with trickle irrigation, can significantly increase yields (see Trickle or Drip Irrigation). For best results 4” to 8” tall plants should be transplanted on a cloudy, calm day, preferable in the late afternoon. Apply one cup of liquid starter fertilizer to each plant (refer to label). carefully meter the water and fertilizer.